Great 3 BR 3 BA house - easy walk to Lake Michigan! The Lodge by the Lake is a hand built home nestled into a sand dune, and just a few blocks from a shared private beach on Lake Michigan. Located in Shoreland Hills, IN. It is just 70 minutes from downtown Chicago, but a million miles away, and offers adults an easy escape from the city and a chance to reconnect with nature and each other. The furniture is inspired by the boutique hotels we have stayed at in places like Napa, Sedona, and Portland with an eye toward design from mid-century masters like Saarinen and Noguchi to current high end furniture makers and custom commissions. We hope you find it a sophisticated departure from the normal “country cabin” feel, but just as comfortable. The home features three bedrooms and three bathrooms with one king and two queen beds- all topped with memory foam pads and soft cotton sheets. All bedrooms have two exposures for great light and refreshing Lake breezes. One bathroom features a steam shower for two. Another offers a separate shower and whirlpool tub. 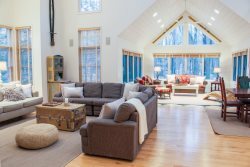 The heart of the home is the cathedral-like 32' x 20' main room which boasts an 18' ft high timber beam ceiling book ended by a curtain wall of glass and treetop views to the west and a massive floor to ceiling stone fireplace and dune grass views to the east. The large, fully equipped kitchen is open to the main room, so everyone feels connected. No need to bring anything but your food and drinks, as we’ve got you covered with anything else you could need to make the perfect meal, including a three burner Weber gas grill. The zinc topped dining table seats 8 for long, relaxing dinners and playing games late into the night. Adjacent to the dining area is the 27 foot long front terrace- a great spot for morning coffee or a nightcap while listening to the crickets and frogs sing their songs around Blueberry Pond across the street. The living room is anchored by a large sectional sofa strategically placed in front of the stone fireplace and a 70” flat screen TV with Comcast cable and Netflix available for movie nights and sporting events. The large screened porch off the back continues the peaked timber ceiling found inside and offers a custom cedar dining table for 8 surrounded by French Tolix chairs draped in sheepskin furs- it’s the perfect place to dine al fresco and catch a view of the deer who often come to feed in the dune grass at twilight. A 63 foot long rear patio separates the Lodge from the dunes and is a favorite spot to play bags or gather around the fire pit and do some star gazing after dark. This house comes with access to the Stop 31 beach, which is accessed at the intersection of Moore Road and Lakeshore Drive. The Lodge by the Lake has a half dozen vintage Schwinn bicycles that can be used to ride through the bucolic communities that dot the Lake; to some of the great local restaurants like the Duneland Beach Inn and Stop 50 Pizza; or to the nearby beach. Beach fires are always special and permitted if done responsibly. Beach chairs and firewood are provided for you too. There are other fun activities nearby including Blue Chip Casino, the Lighthouse Place Outlet Mall, Warren Dunes State Park, numerous vineyards, craft breweries and distilleries, and great shops and restaurants along the chain of towns that make up Harbor Country including New Buffalo, MI., which is a quick 10 minute drive. We look forward to sharing our home with you and are confident that you will love your time here as much as we do!